I mentioned about the CW seminar in my earlier post here. The event is over so here are a few takeaways from the seminar. The good news about CW Small Cells events is that David Chambers (ThinkSmallCell) does a very comprehensive summary. For this one, its available here. For a limited time (for non-members), the presentations from the speakers is available on CW website here. Due to European roaming charges having been scrapped, there is 300% growth in European roaming traffic since last year. Modern inbuilding systems are 2T2R with many older installation still using SISO. Bob Slorach, from Wireless Infrastructure Group (WIG), drew some clear guidelines about building size, pointing to the needs of buildings between about 50000 to 300000 sq. ft. This represents a huge unmet demand of around 2 Billion sq. ft. in the UK alone. As can be seen in the picture above, picocells can serve smaller venues while a 5 watt small cell (microcell) with distributed RF can satisfy the 100 - 300K sq. ft. venues. For bigger venues, a higher power unit would be required. It would also justify to have a neutral host solution so the costs could be distributed and coverage is available for everyone. Adis Omeragic, Special Projects Manager at EE, shared his side of the story. While his slides are still not on the site (they are expected to be available), I have emnedded a tweet below. Some of the points he made were, while passive DAS may no longer be used, active DAS will be around. Only about 5% of DAS deployments in the UK have all four operators connected as of today. According to Adis, DAS displacement is slow because of lack of roadmap alignment between macros and small cells. Small cells upgrade path is very limited. DAS allows Carrier Aggregation, Multi-technology and multi-band capability, SON features which are more common in macros, etc. 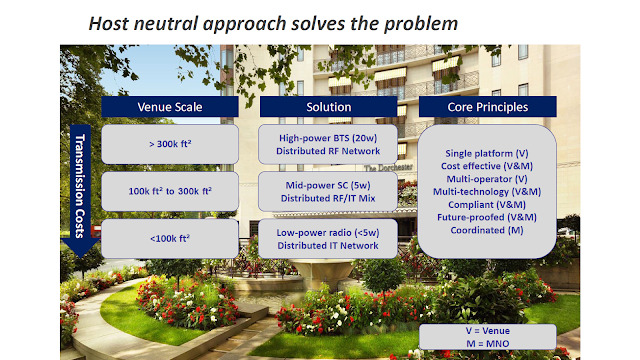 Due to the new features like 4x4 MIMO and even Massive MIMO, things may start going in favour of small cells. One final point that was discussed in the panel was whether VoWiFi is good enough so there is no longer a need for residential or enterprise femtocells. While the panelists agreed that VoWifi is good enough for residential, it may not be good enough for enterprises. I disagree. If the enterprise has designed their WiFi networks properly, this may not be much of an issue. There is other issue of the lack of devices and operators support for VoWiFi. As EE pointed out, they only support it for post-paid customers, on direct contract with them. So pre-paid, MVNO and partner customers wont benefit. Also, its supported in limited number of devices.